Pottery is the ancient art of the wheel that for hundreds of years has made Sifnos the supplier of Greece and of the Mediterranean in household utensils and the word "tsikalas" (potter) synonymous to "Sifnos". The art of pottery remains unalterable up to now, at Giannis Apostolidis’ workshop, "En Sifno (In Sifnos)", and passes from generation to generation; it is a family tradition of 100 years of experience! The story begins at the end of 1800 with the potter Giannis Apostolidis, grandfather of today’s Giannis, after whom he was named. The grandfather passed on his passion to his son Simos Apostolidis and he, in his turn, introduced his son, Giannis, to the art of pottery. Giannis represents the third generation of potters. 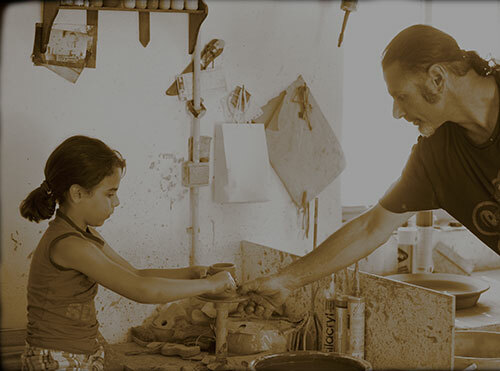 He is experienced and creative and he practices the art of pottery, expressing his passion at his potter’s workshop in the area of Leivadas, on the central road from Kamares to Apollonia. 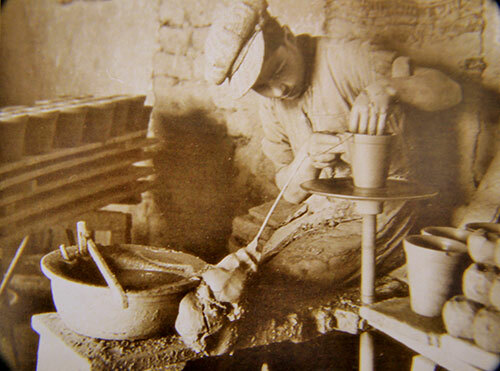 You will find him there, every day, giving life to the clay by creating with love, imagination and passion, ceramics, such as cooking utensils (earthen cooking vessels), utilitarian objects (plates, mugs, ashtrays etc) and many more beautiful and special objects. If you visit the potter’s workshop you will have the opportunity to see earthen utilitarian, decorative and thematic ceramics that will impress you. Keeping the tradition, he passes on, in his turn, his art and his love for it to his younger son, Simos! We would like to thank for their photographs: Triantafilos Alexiou, Varvara Spiliopoulou, Giannis Kontos, Emily Bedixen and Jacqueline Meier. ​Watch the video that was filmed from a guest. ​Watch the video that was filmed for a TV show.